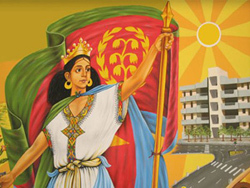 Eritrea Celebrates its 21st Independence Anniversary | .:TesfaNews:. The African continent can benefit from all the accomplishments this new country Eritrea has done within its life span of only 21 years. Eritrea, despite the obstacles faced, with its consistent and undivided attention to achieve what is right for its citizens, it is able to show tangible progress in the sectors of health, education, infrastructure, agriculture and communication. Based on UNICEF’s report “Eritrea has made significant strides in reducing [of] child mortality….most notably in relation to MDGs 4 and 6 (child health and HIV/AIDS) …. The Government’s strong commitment to unity and resilience has enabled these gains while many of its neighbors are lagging behind.” The same report also acknowledged the challenges Eritrea is facing in particular to the “no peace no war” stalemate with its southern neighbor Ethiopia. Eritrea has worked on providing equal access to all its citizens within the country. Among Eritrea’s bold move is how it created nomadic schools to accommodate those who move from place to place. The enrolment of students is at its highest level. Eritrea worked so diligently to educate parents and guardians of children that it’s compulsory for all children to attend to school. Building of primary schools is the prime project of the ministry of Education. The adult illiteracy rate that was around 80% at time of independence is now projected to fall below 10% by 2015. The story is the same in higher education. The country has now 8 colleges as opposed to only 1 at time of independence. Starting in 2009 the country is annually graduating about 35 medical doctors. Eritrea has also been able to connect most of its remote villages through an amazing network all season roads. Some of the terrain where these roads, where impenetrable by any stretch of imagination, but local know how and determination has made it possible and now they are a marvel for tourists. The new road that connects the town of Adi Qeyih with the port city of Massawa is an engineering marvel. The travel distance between the two cities is now 25% of what it was few years ago. Now that most of the villages’ towns and cities are linked, and plenty of new transportation buses have been imported, the agony has been part of the past. Several of these roads are now slated to be paved in the coming few months. Eritrea is also working with its air and sea transportations for the convenience of its citizens with in the country and the Diaspora and visitors. The following can give a glimpse of the total picture of roads in Eritrea as of 1996. Since then within the last 6 years a lot has changed. Every single day counts when it comes to Eritrean progress. From the above information it is understandably that Eritrea is progressing on the right truck. This could be a good example if our African continent utilizes the methods Eritrea is following. This entry was posted in News, Opinion and tagged 21st independence of eritrea, Eritrea, Eritrea development, eritrea gdp, Eritrea independence, Ethiopia. Bookmark the permalink.